The first work on Nederlands Dans Theatre 1’s season at Sadler’s Wells plays uncomfortably between entertainment and oppression. It’s as if house choreographers Sol León and Paul Lightfoot have abruptly interrupted the five dancers — Myrthe van Opstal, Chloé Albaret, Marne van Opstal, Roger Van der Poel and Jorge Nazal — in Shoot The Moon and leave us to observe the intensity of their unstable relationships on a revolving set of three rooms from which the only exit is through a door or window into the next one. The program note suggests each room contains its own love story, but the febrile gestural vocabulary, clinical partnering and the open mouths of despair suggest each individual is going through hell and has no psychological space for anyone else, while the pervasive trope of effortless high extensions suggest a compulsive narcissism. It is as if Ibsen’s dramas of domestic claustrophobia have met Virginia Woolf’s fragmented narratives without the nuanced psychology of the former and the acute formal tension of the latter. One might almost conclude that set, costumes and live, voyeuristic video of the dancers projected on the clerestory-level screen are all part of a hermetically sealed aesthetic of neurosis. León and Lightfoot choose Philip Glass’s Movement II from his Tirol Concerto for piano and orchestra to lend the work emotions that are absent from the choreography; it is not music on which the dancers rely for their musicality but rather a score to appease the audience. If the elements of Shoot the Moon were limited to conjuring up the images it portrays it would make an interesting study in the power of the unconscious to affect a choreographic outcome, but seeing the company’s assistant choreographer Marco Goecke’s Woke up Blind suggests an NDT 1 house aesthetic. Again the subject is love, as expressed in two songs Jeff Buckley recorded, his own You and I and Van Morrison’s The Way Young Lovers Do. The first person we see from a cast of seven is Nozal who hasn’t yet recovered from the tension of Shoot the Moon, but Buckley’s voice is also in a register of despair. At least Goecke is trying to match the fevered pitch of his choreography to Buckley’s overwrought state of delivery, but given its gestural similarity to Shoot the Moon and its translation onto technically precise dancing bodies, the effect barely shifts NDT 1’s tormented aesthetic. It only takes a pause to rectify this. 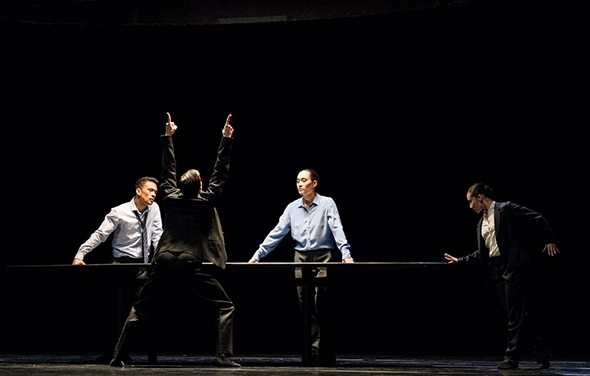 In The Statement, Crystal Pite uses four dancers — Aram Hasler, Rena Narumi, Jon Bond and Roger Van der Poel — to recreate a boardroom scene in an international investment office that has just fomented an international conflict in order to profit financially. On an otherwise dark stage, Jay Gower Taylor places a long, shiny oval table that Tom Visser lights from a similarly dimensioned hood above it; the concentration of light on the figures assembled around the perimeter dressed neatly and expensively by Pite and Joke Visser is intense. Their preoccupation is how to make a statement that exonerates their superiors without taking the blame themselves. Using a recorded one-act play by Jonathon Young with the voices of Young, Meg Roe, Colleen Wheeler and Andrew Wheeler, Pite choreographs to the accents and inflections of its tightly woven and increasingly confrontational argument. In extending choreography into mime and mime into choreography, Pite puts the polished virtuosity of the dancers at the service of gesture; nothing is gratuitous. In its message and expressive power, The Statement can be seen as a contemporary successor to Kurt Joos’s The Green Table. It’s hard to return to the house style of León and Lightfoot in the final work, Stop-Motion, where love is replaced by ‘a process of farewell and transformation’, the revolving rooms by an empty space and Philip Glass by a mournful Max Richter. The set by León and Lightfoot with its chalk dust is visually arresting under Tom Bevoort’s lighting and its effect is evocative of the ephemeral nature of life. The large-scale, close-up video work, directed by Rahi Rezvani, conceived by León and Lightfoot and featuring their daughter Saura, is reminiscent of choreographer Édouard Lock’s interest in and integration of film and performance for La La La Human Steps. However the visual gratification of Stop-Motion is no substitute for psychological insight and emotional strength and while the choreographic use of space has changed from Shoot the Moon, the vocabulary remains within a narrow band of imagination that fails to release the full potential of these dancers beyond their shapes and extensions.